Looking for something to do on a beautiful summer day in the Dayton area? 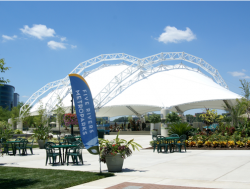 Start by exploring RiverScape MetroPark in downtown Dayton! Once known as Van Cleve Park, RiverScape is a great place for children and adults alike to enjoy the outdoors. You can people watch as you sit in the swings that overlook the river and watch the Five Rivers Fountain of Lights. Or, for more active fun, bring your bike or rent one at the park and hop on the adjacent bike trails. Nights and weekends are packed with events. On Thursday nights, visitors can take part in a five-mile canoe trip on the Miami Valley River. Folks can spend Saturday afternoons at “Sunny Saturdays” for food, live music, and a day on the river. The Fountain Concession has anything you may need to quench your thirst or cool you down on a hot day. Plus, every afternoon there usually is a local food truck to try. There also are various free activities promoting outdoor fun and fitness, and the park hosts many festivals throughout the year. Whether on your bike, on foot, or on the water (or even on ice skates during the winter), RiverScape MetroPark offers something to enjoy for people of all ages!